"You want to be a criminal defense attorney? Then know this going in: everybody's guilty. Everybody." Stars: James Woods, Robert Downey, Jr. 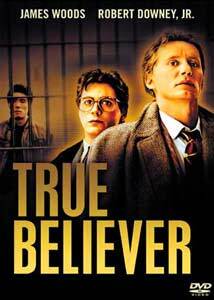 True Believer stars James Woods as Eddie Dodd, a once-idealistic radical lawyer, and Robert Downey Jr. as Roger Baron, a young law clerk anxious to work at his side. Baron discovers to his dismay that Dodd has become a sleazy defense attorney, hired primarily by drug dealers. Young Baron convinces Dodd to accept a case involving one Shu Kai Kim (Yuji Okumoto), a man whose murder conviction eight years earlier appears questionable. As Dodd and Baron tackle the case with the help of private investigator Kitty Greer (Margaret Colin), some powerful people become interested in its outcome, particularly District Attorney Robert Reynard (Kurtwood Smith). There are few surprises here—the battle lines are drawn early and clearly, and while the twists and turns are not entirely predictable, the final outcome is rarely in doubt. The plot's many weaknesses are not so much holes as stretches; the conspiracy uncovered by our heroes is so ill-motivated and politically convoluted that it seems unlikely to have survived eight days, let alone eight years. Worse, the film can't decide whether it's a courtroom drama or a detective story—even as the case goes to trial by day, Dodd and Baron are uncovering new evidence each night, and the audience is given too much information. This leads to a major problem in the third act, wherein Dodd calls a surprise witness and supposedly "reveals all" to the jury. His wrap-up is abbreviated and oblique, taking so much for granted that after the defense rests, his client's acquittal seems anything but certain. One imagines the jury scratching its collective head and dismissing Dodd's closing argument altogether. This is not to say that True Believer is a hard pill to swallow—it's actually very watchable, thanks to consistently strong performances from some actors more recently recognized as among Hollywood's finest. James Woods' customary intensity is balanced nicely by Robert Downey Jr.'s endearing youthfulness. Kurtwood Smith's smug, arrogant Reynard makes a fine villain, and Luis Guzman shines in a small supporting role. Director Joseph Ruben seems content to let his actors work, and few wrong notes are immediately visible onscreen despite an increasingly chaotic and nonsensical context. But the story's general hokiness ultimately catches up with it— by the time the credits roll, the ride is over, and it's not one you're likely to want to take again. Still, True Believer is fun while it lasts. Image Transfer Review: Columbia TriStar presents True Believer in its original 1.85:1 widescreen theatrical aspect ratio, with a 1.33:1 pan-and-scan version on the flipside. The anamorphic transfer is very solid, with naturalistic color and good detail marred only by a few grainy scenes, moire effects and minor print wear. The pan-and-scan transfer has a similar look; it crops the image to fit, but the film appears to have been shot with video in mind and survives the process reasonably well. No real complaints in this department. Audio Transfer Review: True Believer features its original English Dolby 2.0 Surround audio, as well as monophonic French, Spanish and Portuguese tracks. The 2.0 matrixed surround track is surprisingly active, with enveloping atmospheric effects, smooth bass and a crisp score. Courtroom dialogue scenes occasionally exhibit an odd low-frequency "thumping" effect, but this is the only major flaw in an otherwise solid audio presentation. The dubbed mono tracks sound "collapsed" in comparison, but are generally clear with comparable frequency range. Brief, bullet-list biographies and selected filmographies for director Joseph Ruben and stars James Woods and Robert Downey Jr.
No sign of the original True Believer theatrical trailer here, just a sorry pair of trailers for "related" films - A Few Good Men and Absence of Malice. Both are mastered from videotape, presented in 1.33:1 pan-and-scan format with weak, bass-free 2.0 Surround audio. True Believer is a muddled but watchable courtroom drama, with strong performances compensating for serious structural weaknesses. Columbia TriStar's DVD features a solid transfer, with broad language support but few supplements. Most appropriate as a rental.